You are here: Home / Ethnic Groups / The People of Sulawesi / Who are the Gorontalo? The Gorontalo live in the northern part of Sulawesi island between the provinces of Central Sulawesi and North Sulawesi with the Sulawesi Sea to the north and the Tomini Bay to the south. In the year 2000, Gorontalo officially gained provincial status when North Sulawesi province was divided in two. The area has extensive coastlines, rugged mountains and a large central valley with beautiful Lake Limboto at its center. The Gorontalo have traditionally lived along the coast and in the fertile lowlands beside rivers and streams. The Gorontalo language is part of a larger linguistic grouping called the Gorontalic family which also includes the Bintauna, Bolango, Lolak and Suwawa languages. Gorontalo is spoken by 90% of the Gorontalo. Those in the extreme eastern district speak Suwawa. The Gorontalo make their living by farming or fishing. An important segment of the people are active in various businesses, from selling used clothing in the marketplace to running national companies. A number are powerful national figures. Locally made crafts include rattan kopiah (a type of Muslim hat), distinctive Kerawang embroidery, and woven mats. Handicraft centers are found in the various districts and in the municipality of Gorontalo. Tourists enjoy the view of Lake Limboto from a cluster of three ancient Portuguese forts. The city offers a number of budget hotels. Currently, there are several airlines that serve the newly expanded airport. Gorontalo genealogy is bilateral (traced through both parents). Within the immediate family, children are not allowed to joke with their father, but must act respectfully. This is also true for interaction with older adult relatives. However, relationships are more open with grandmothers and older siblings. 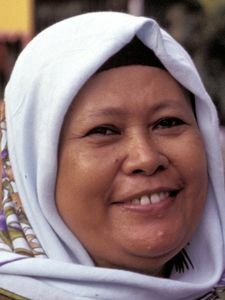 The Gorontalo have been Muslim since the 16th century. They observe Friday prayers with colleagues from work. Many residents also walk to their neighborhood mosque for evening prayers. Each village contains one to three mosques. Fasting is widely observed during the month of Ramadan. Those of higher position or education tend to be more diligent in their religious observances than their poorer village counterparts. Despite being strongly Islamic, many Gorontalo still believe in motolohuta (supernatural creatures) and hulobalangi (mysterious powers). They are both afraid of and fascinated by these. Others believe that the graves of people who possessed supernatural power in ancient days are sacred. These graves are scattered about central Gorontalo. The Gorontalo leaders are aware of the challenges inherent in organizing and governing a new province. Public works projects such as drainage systems and the opening of new businesses such as restaurants and local print media are an important part of ongoing development.